The global clinical decision support systems (CDSS) market comprises of software and services which help healthcare providers reduce the rate of medical errors during the healthcare delivery process. This, hence, significantly aid in improving clinical outcomes and facilitate reduction in healthcare costs. The market has evolved dramatically as a result of rising number of deaths due to medical errors, changing reimbursement models and healthcare delivery framework. These changes have fuelled the level of investments in the clinical decision support systems. Although, the major contributors to these changes remain rising healthcare costs and rapidly increasing rate of hospital readmissions. In order to combat these adverse events, healthcare organisations are now more focused towards achieving evidence based clinical outcomes with the help of CDSS tools which generate alerts to prevent any misdiagnosis during any medical process. The healthcare system is also expected to witness the shortage of physicians in the upcoming years enhancing the need of decision making tools in order to effectively manage physician time and prevent the overcrowding of hospitals due to increased medical needs. Management of physicians’ time is an important aspect in clinical diagnosis and is reflected from the fact that approximately 32% of the medical errors are caused due to shortage of physicians’ time for the patient’s assessment which significantly enhances the chances of misdiagnosis or an adverse event. The market report is well designed to provide an all-inclusive field of vision for the market in terms of various factors influencing it such as recent trends, technological advancements, and regulatory environment of the market. The scope of this report is centred upon conducting a detailed study of the solutions allied with the global clinical decision support systems market. The market has been segmented into Product, Mode of Delivery, Application, Model, User Interactivity and Geographical Regions. The report presents the reader with an opportunity to unlock comprehensive insights with respect to the market and helps in forming well informed strategic decisions. The research uncovers some of the substantial parameters that must be taken into consideration before entering into the market. 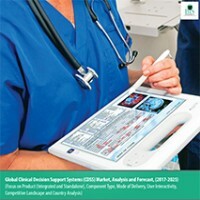 This research report aims at answering various aspects of the global clinical decision support systems market with the help of the key factors driving the market, threats that can possibly inhibit the overall growth of the market and the current investment opportunities that are going to shape the future trajectory of the market expansion. The study considers the growth-share matrix model for a comprehensive study of the global clinical decision support systems market and assesses the factors governing the same. • What is the Total Addressable Market (TAM), Segmental Addressable Market (SAM) and the potential market opportunity of the global clinical decision support systems market? • What are the major market drivers, challenges and opportunities in the global clinical decision support systems market and their case studies? • What is the market share of the leading segments and sub-segments of the global clinical decision support systems market in 2016 and 2025? • What did the CDSS market evolve and what are the factors that necessitated its evolution? • How will each segment of the clinical decision support systems market grow during the forecast period and what will be the revenue generated by each of the segments by the end of 2025? • What will be the consumer preferences in terms of adoption of clinical decision support systems during the forecast period? • What is the preferred model used for building clinical decision support systems and how will this segment grow during the forecast period? • How will the most preferred mode of software delivery grow during the forecast period? • Which application segment will be the highest revenue generator in this industry during the forecast period? • What will be the scope of clinical decision support systems market in the emerging countries during the forecast period? The key players who have significant contributions to the Global Clinical Decision Support System industry are Cerner Corporation, McKesson Corporation, Allscripts Healthcare Solutions, Inc., The National Decision Support Company, Zynx Health, VisualDx, FirstDataBank, Elsevier B.V, IBM Corporation (through acquisition of Truven Health Analytics). 12.21.5 Aprima Medical Software, Inc.
37 Overview- Allscripts Healthcare Solutions, Inc.
43 Overview- First Databank, Inc.
51 Overview- Oncology Analytics, Inc.
77 Medication Error Reported per 100,000 Population in the U.K. Despite great measures undertaken in the development of healthcare information technologies, uncertainty still lies at the core of most of the aspects of medical decision making. For instance, globally, preventable medication errors cost over $1 trillion each year, of which the U.S. economy alone incurs $21 billion. Dosing errors, drug allergies and harmful drug interactions account for over 50% of these errors. This has prompted the need to provide means for clinicians to receive the relevant knowledge and research based evidence necessary for safe, effective and efficient clinical decision making. Technology interventions through deployment of clinical decision support systems (CDSS) such as e-prescribing systems, Bar Code Electronic Medication Administration System (eMAR) and Computerized Physician Order Entry (CPOE) could reduce these errors by over 85%. The healthcare reforms across the globe have forced organizations to rapidly re-evaluate how physicians, nurses, and other providers access and utilize clinical information. CDSS is considered to be one of the key drivers of meaningful healthcare reforms in the recent times. CDSS is a health IT system that assists physicians and other health professionals with clinical decision-making tasks, supporting them in diagnosis and treatment. CDSS has proven to be effective at improving outcomes at several state-of-the-art health care institutions by reducing adverse drug events, medication-related errors and costs by millions of dollars per year even within single hospitals. The global CDSS market is expected to expand manifold during the forecast period with the emergence of machine learning and artificial intelligence. Machines capable of deciphering physicians’ notes from hospital or clinic encounters, radiology and procedure reports, prescriptions and lab result data are expected to become common within the next decade. Despite promising initial advantages, a majority of clinical decision support systems has not provided features beyond general alerts, reminders, summary dashboards, and automated information retrieval systems. CDSS technology is still in its nascent stage and continuous input from clinicians, patients, and other stakeholders will be essential for correctly implementing the technology to enhance meaningful uses, reduce costs and improve treatment outcomes. In the global CDSS market, a plethora of opportunities is presented from the emerging countries such as India and China. For example, China is struggling to deal with the problems associated with cataract faced by the ageing population. The nation currently accounts for 18% (approximately 5 million) of the global population suffering from blindness, thus providing the key players an opportunity to work closely with a local partner to develop dual language decision support systems which could be adopted easily by the clinics in China. Furthermore, development of different versions of CDSS using multiple language is a great way which a company might use to explore various opportunities in different regions across the globe. The opportunities for investment are substantial in number in the CDSS market with untapped demand from various verticals within the healthcare industry. For instance, expansion into solutions such as women’s health, anaesthesiology, imaging, and clinical process optimization can open new opportunities in this regard.